Wildlife World Zoo – Wait until feeding time! Andy and I spent our Sunday afternoon at the Wildlife World Zoo in Litchfield Park, Arizona. It’s a small zoo that just happens to have a new aquarium on the property, and since it’s close by, we thought we would see if we could get some good photos of the animals. We got there shortly after 1:00 PM, and for the first hour or two, we were pretty disappointed. Most of the animals we saw were in smaller enclosures with lots of chain link or mesh fencing, and with the sun glaring off the metal it was hard to even see, much less photograph the animals inside. Most of them were in the shady, hidden parts of their enclosures away from the midday sun. Even though it’s winter here, the temperatures were in the high 60’s to low 70’s, and it gets pretty warm if you’re not in the shade. After a couple hours, we finally stopped in a little cafe to get some ice cream, a cold drink and just rest our feet for a little bit. After we started out again, we found we were in the part of the zoo where the enclosures were more open. The exhibits in this area were larger for the bigger animals like the zebra, rhinoceros and giraffes, but most of them were still shying away from the open part of the enclosures so they were still hard to photograph. Up until about 4:00 PM, the best shots I could get were of the swans and ducks that people were feeding in the ponds. We tried really hard to get some decent shots of the white tigers, for which the zoo is well known, but once again the chain link enclosures ruined the photos. We finally went to the 4:00 PM show where the zoo personnel bring out some small animals and let them perform for the kids (and us adults). By the time the show ended about 4:30, the sun was starting to set, and that’s when the animals started to come alive. We walked back through parts of the zoo we had already seen, and this time the animals were up and active. It was feeding time in the park, and so it was like someone had flipped the “on” switch. It also helped that the sun was at a lower angle, so the light wasn’t as harsh. We were able to get some fairly decent shots of some of the larger animals before the sun got too low. About 5:00 PM, we decided we had better go through the aquarium since it closes at 6:00. I had my tripod with me, but I wasn’t really in the mood to use it inside the aquarium, so I didn’t get a lot of good shots in the dim light from the fish tanks. 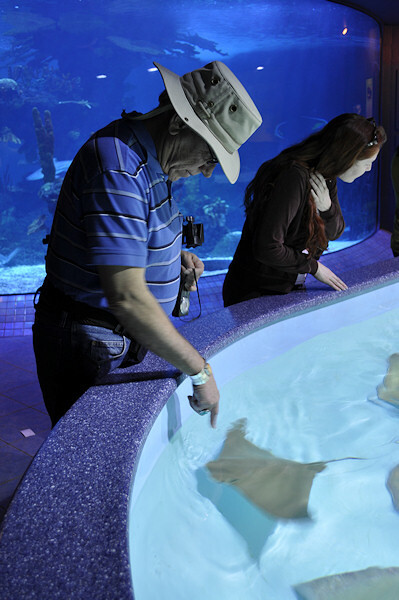 They had some very nice exhibits in there, though, and we got to pet the starfish and the stingrays, which was fun. We left the zoo about 6:00 and stopped at The Auld Dubliner in Park West for some good Irish food on the way home. And now it’s time to wrap up the weekend and get ready for the work week. I’ve transferred all the photos from my camera to the computer and I’ll start going through them this week, but I already have one favorite. 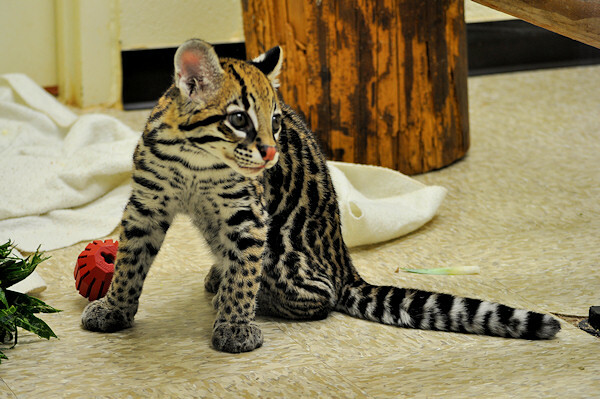 This is a shot of the baby ocelot that’s in the nursery at the zoo. It’s about three months old and was just adorable. This shot was taken without flash, through glass. Oh, I’m happy to report that my new camera bag worked out splendidly on this excursion. I still want to get the straps to attach the tripod to the bottom of the bag so that we don’t have to hand-carry it. All in all, it was a very good weekend, but I’m bushed!! This entry was posted in Shooting and tagged animal, Arizona, bag, camera, D5000, Nikon, photography, tripod, zoo. Bookmark the permalink. Can’t wait to see the photos you came away with at the World Wildlife Zoo. I am excited to hear great interest from the zoo. We have thought about going there but, did not know if it was worth it. I hope Andy did not get his finger bitten.